You're welcome. Thought it was a nice tribute to Henry. He had my respect, although I believe he didn't portray himself well at the RC - great pity, great loss to the industry and I'm sure if he had his time again he would have acted differently. they would leave the bank. Mr Thorburn will finish at NAB on 28 February 2019. Dr Henry indicated he would retire from the Board once a new permanent CEO had been appointed. 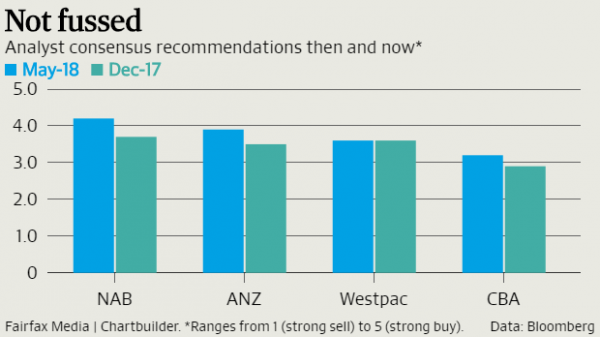 Going by Bloomberg consensus recommendations, NAB is the most popular, with a consensus "buy" call, followed by ANZ (just shy of a buy), followed by Westpac with a solid "hold" rating. 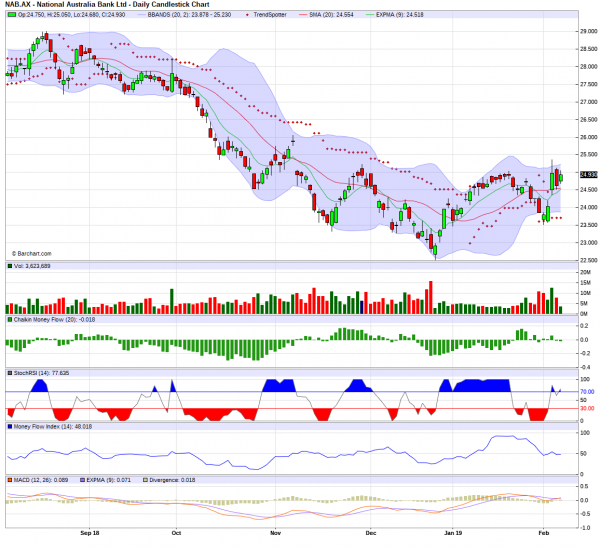 CBA ranks last of the four, barely scraping buy with a hold. The report carries a blunt warning that NAB's failings "demand a significant regulatory response". I'm glad the banks are getting out of this nonsense, nothing worse than having to watch an obviously overweight CEO on the TV rambling on about "organic growth". All this vertical integration has been testing my vertigo. National Australia Bank is set to offload its wealth business MLC, which includes financial advice, superannuation and funds management, as the major banks' exodus from the wealth sector continues. NAB had already previously sold 80 per cent of its life insurance arm to Nippon Life. NAB also reported first-half cash earnings of $3.3 billion, a 0.2 per cent decline compared with last year, excluding one-off restructuring costs. Cash profit fell 16 per cent when restructuring costs were included. NAB has closed down 17 days out of the last 22 trading days. 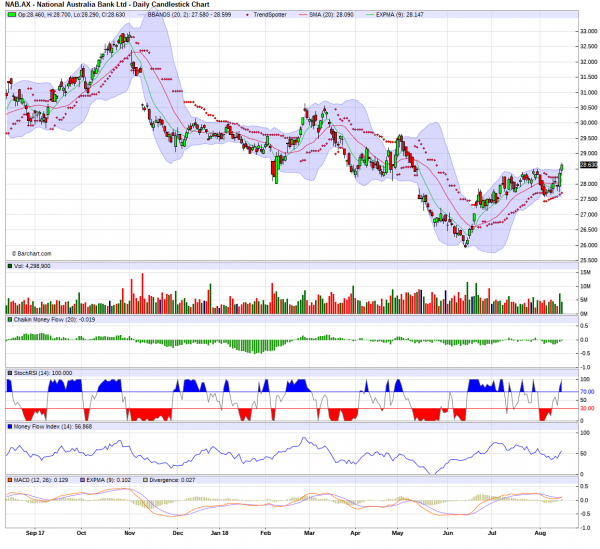 From $30.40 to a low of $28.47 today. Should have purchased some Put Warrants but never though it would drop so fast or as much.